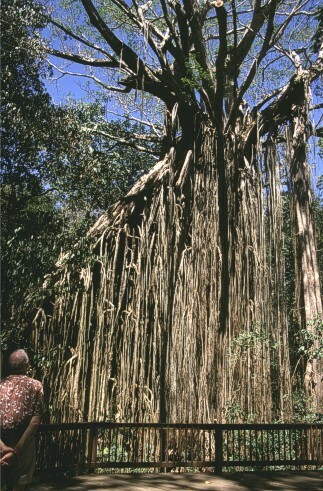 The Curtain Fig is not a special species, it's a special growth of Ficus virens due to special circumstances. Normally these parasitic figs germinate ontop of another tree and try to make roots into the ground. Once that important step is done, the fig will grow vigorously, finally kill the hosting tree and then grow on independently. In this case the hosting tree tilted towards the next one, the fig also grows around that one, the second tree tilted and so on. And from all states the fig sent it's roots to the ground. One finds this impressive sight near Mossman Gorge.